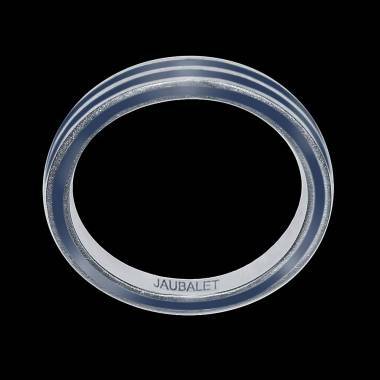 Jaubalet’s wedding rings for men are designed with creating a pure statement of love. A luxury wedding band should represent the personality of the man and the romantic connection that he shares with his chosen one. 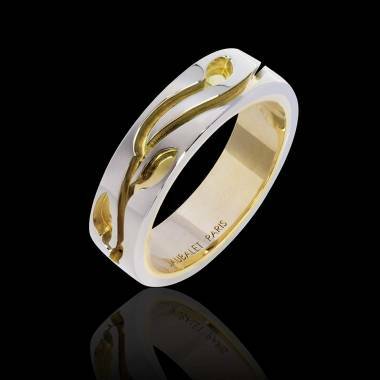 As your love will last a lifetime so will our men’s wedding rings, as our high quality gold is designed by our skilled craftsman with eternity in mind. Men’s wedding rings have a much shorter history but are just as romantic as the women’s wedding bands. When World War II broke out, young couples including newlyweds were often split apart due to the conflict. The wedding bands worn by most soldiers were simple bands of metal, occasionally with a few words or a name engraved into it. This piece of jewellery was often their only bond to the woman, and offered these young men comfort in a time of imminent chaos. By the end of the war, men’s wedding bands became a recognised element of a wedding. So much so that 80% of all weddings registered directly after the war included rings for both parties. A popular choice among men, the white gold wedding ring is ideal for men whose only real piece of jewellery is his wedding band. 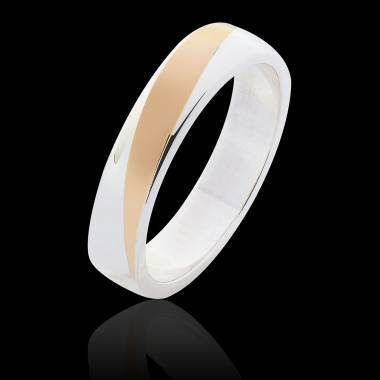 The white gold metal is a perfect accessory to match a wristwatch or cufflinks. Most men look for a wedding ring that is discrete, durable and resistant to many factors. A white gold wedding ring will do all those things, as a supreme luxury for a man’s first piece of jewellery. 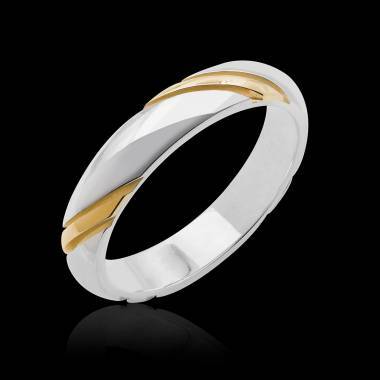 The most traditional of men’s wedding rings is the Yellow Gold Band. As a neutral ring that is durable and resistant, its style is in keeping with traditional styles. As timeless as a wedding band should be, yellow gold never loses its colour. Your magnificent 18 carat yellow gold wedding band will bring eternal love to your wedding day. Platinum is the epitome of uniqueness. Rarer than Gold, what better metal to adorn your finger as a symbol of your unparalleled love? As a most precious, shiny and resistant metal, a platinum wedding band is perfect for being worn regularly. What to consider when buying men’s wedding rings? When choosing the right wedding band, make sure that you consider your skin, and any intolerances to materials you might have. This is why most wedding bands are made of gold, platinum and sometimes silver. These metals are not only anti-allergenic (to different degrees) but are also durable. Take into account your budget when selecting your wedding ring. In general, you will be able to find wedding bands for every budget. If quality is a major concern for you, plan for a more substantial price, as the more precious metals will cost more. It is always best to invest in a high quality ring as a one-time purchase rather than running the risk of having to replace a lower quality band after a few years. This is why at Jaubalet Paris, we offer wedding rings for men of the highest quality, designed by our expert craftsmen from in Place Vendôme. Your wedding band should be a pleasure to buy and a pleasure to wear, which is why you should always choose a design which you feel most comfortable wearing. 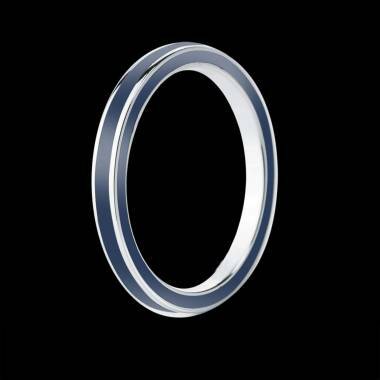 Historically, slightly curved outer face rings have been a very popular design amongst our customers. This is why we make it possible for you to browse different designs and types of wedding rings virtually, on our site. Depending on your tastes, finger size and shape you can adapt the band to your finger or simply order a custom-designed wedding band through our website’s live chat function. We recommend that if you are regularly involved in a high risk or manual profession or activity, you should protect your wedding band by wearing it around your neck with a chain. Don’t hesitate to ask one of our jewellers for more advice. 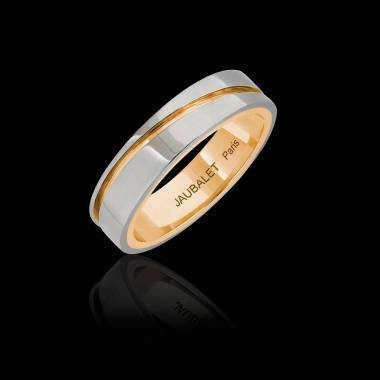 At Jaubalet, our custom made bespoke Men’s wedding bands can be altered to suit your tastes. Always make sure you refer to our size guide to ensure that you have the perfect fit. Your customisation options don’t end there as you can choose the metal and the precious gems you would like placed on the ring. With full personalisation options, you can create the most unique of men’s wedding band. We will even create a 3D Wax Jewellery prototype for you to try to ensure it is the right wedding band for you. Get in touch with Jaubalet or book an appointment at our London Mayfair office to discuss creating your custom-made men’s wedding ring today.